If the essence of drama is conflict, then the most dramatic of games will always revolve around the diametric opposition of two key ideals, and the supporters of those ideals rallied together on each side. We see this in games about war, games about revenge, games about politics and even games about relationships - whether through mechanics or cutscene philosophising, the conflict is always perceivable to the player. Danganronpa: Trigger Happy Havoc, a visual novel by Spike Chunsoft, embodies this method of storytelling to a T, focusing on the opposition between hope and despair and charging the player character to defend optimism in the face of an ever mounting gauntlet of fear and distrust. It's darkly humorous, compelling and often times offputting, with a rapid pace that keeps players feverishly advancing text until the truth is revealed. Also, the blood is bright neon pink. That last detail probably describes Danganronpa's tone better than any other sentence I've written so far. Related reading: For a second take on this game, check out Matt's review of the original on PlayStation Vita. The premise is that fifteen schoolchildren, each the absolute "ultimate" in their field, are invited to attend a prestigious Japanese boarding school known as Hope's Peak. By gathering the best and brightest Japanese youths, the school board aims to revitalise hope in the next generation. Or at least, that's the original idea: the fifteen students are knocked out when they first enter the school and wake to suddenly find themselves in Despair Academy, a school with no classes, bolted windows, constant surveillance and perhaps the most terrifying character ever written in a videogame, Monokuma. The children are instructed that they are trapped in the school forever and will be cared for, although all communication to the outside world is prohibited. The only way out is to murder a classmate and avoid taking blame for the crime. Danganronpa takes a lot of inspiration from the "school aged children do terrible things to each other" tropes present in Japanese films such as Battle Royale and Confessions, in which we see how societal pressures to achieve and excel can drive out the human capacities for love and empathy. Danganronpa is a more hopeful game than one would expect though - Monokuma actually has quite a hard time convincing the kids to kill each other and the game subsequently becomes an exploration of the despair required for a person to reach their limit and lose all previous convictions against violence in order to take the life of another. The violence itself is sparse but when it strikes, it can be truly disturbing. The real killer in Danganronpa though, is paranoia. The belief that no character could be who they seem is driven home hard, and the writers go to lengths to make sure the player trusts nobody. This makes for a great plot with an unprecedented amount of twists and turns, and the narrative complements the gameplay excellently in this regard. 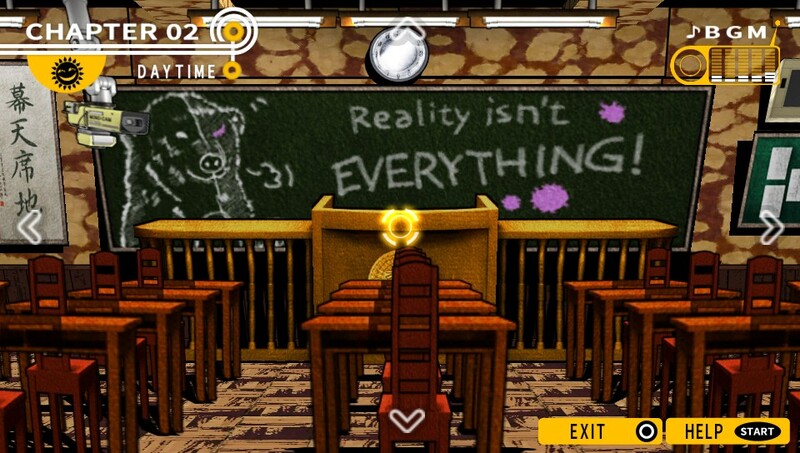 Danganronpa is, in fact, very much like games in the Ace Attorney franchise. The player is first tasked with exploring, observing and investigating, and their knowledge of the details of a crime are then tested in a trial segment. At its worst, the trial can feel like a comprehension exercise where the culprit is obvious from the get go and you're just waiting for the time when you can finally accuse the murderer. 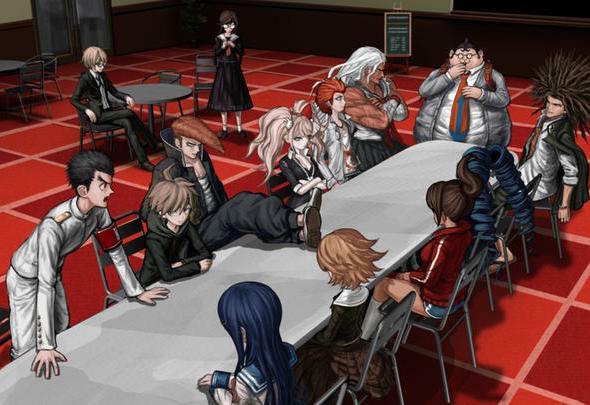 At its best, everybody is a suspect and you're feverishly going through information and refuting arguments in order to save the lives of all the innocent students (because Monokuma's rules state that if the kids blame the wrong person for the crime, that killer goes free, and all the other kids are executed). 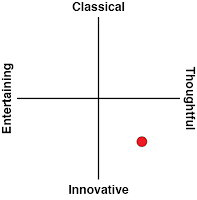 This is helped along by sharp writing, voice acting and interface design to ramp the tension to a maximum. The cast of characters is well rounded but does utilise stereotypes for a while before it really gets off the ground. Each student is an "Ultimate", such as the Ultimate Baseball Player or the Ultimate Programmer, but also some unexpected ones like Ultimate Biker Gang Leader and Ultimate Fanfiction Writer. The protagonist is the Ultimate Lucky Student, having received an invitation to the school for no other reason than winning a random selection. This means you'll be playing the only "normal" person in a cast of powerful personalities, which does feel overwhelming at the start. This is intentional, by the way - the writers have a real skill for understanding audience expectations overturning them unexpectedly, and going into the game with as little information as possible achieves the best effect. The game does eventually lose its reliance on caricatures and stereotypes through effective writing which forms relationships between the characters, so keep at it if the dialogue seems a little dry to you at the start. And then there is Monokuma, who deserves an entire paragraph to himself. The black and white bear who dominates all promotional material is the de-facto principal of Despair Academy and acts as a Big Brother of sorts, monitoring everyone and placing restrictions on students to tempt them into killing each other. In the trial segments Monokuma is also the judge, jury and executioner, with particular focus on the executioner part - he has in fact devised cruel and ironic deaths for each of the students should they be found guilty of murder. Monokuma is terrifying but he's also charismatic and unpredictable, and a real breakout character for the series. I've tried to be as spoiler free as I can so far in this review, but now would be a good time to mention that the series' continuity is important, and later games assume you've played the earlier ones. Trigger Happy Havoc is the first in the series, and the ending is both incredibly unorthodox and immediately apparent in the subsequent titles, and everywhere, really. Proceed with caution please! 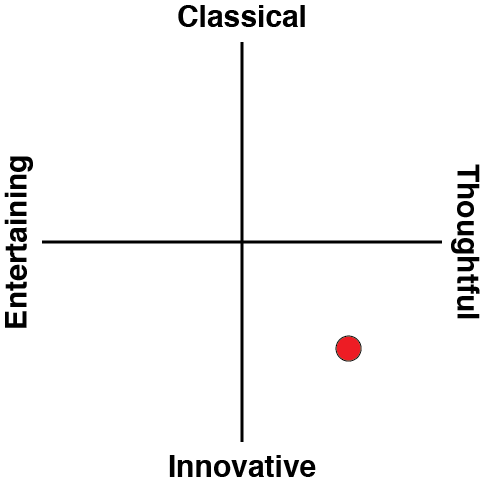 One should note that the story is completely linear, with absolutely no differences between playthroughs. There are a couple of different endings but there is a very clear Golden End which is possible to attain on the first playthrough - aside from that, the order of deaths is the exact same each time and the player has largely no influence on how the plot unfolds. Conventional things such as dialogue choices and event flags don't exist here. You can have some choice in which characters you decide to hang out with in your free time (and thus, how much of that character's backstory you experience), but that's as much agency as you'll ever get. My other gripe is with the game's inconsistent tone, which flips between comic and deadly serious and back again often. Much of this can be attributed to Monokuma, whose sadistic enjoyment of carnage leads him to make bad puns in the worst of times, but Spike Chunsoft also seem intent on wedging in school-life segments into places where they really don't belong. The free time sequences, where you're left to explore the empty school, are entirely unnecessary as well, and I almost wish the game was just dialogue from beginning to end without tedious running and searching for gold coins in background details. The graphics offer a pseudo 3D effect and 2D models for nearly all objects in the game. Danganronpa is a fantastic example of using visuals and sound to reinforce the game's tone, with environments that are colourful in all the wrong ways and a soundtrack which isn't memorable but lingers in your mind and haunts you every time you hear it. Related reading: The sequel should be making its way to PC soon enough too. Check out Matt's review of that here. If you're keen for one of the suspenseful thrillers manageable with just images and text, Danganronpa: Trigger Happy Havoc comes highly recommended. The story stands alongside any mystery film or novel, and the writing lets you understand and even befriend the characters before you're forced to see them pushed to their psychological limit.